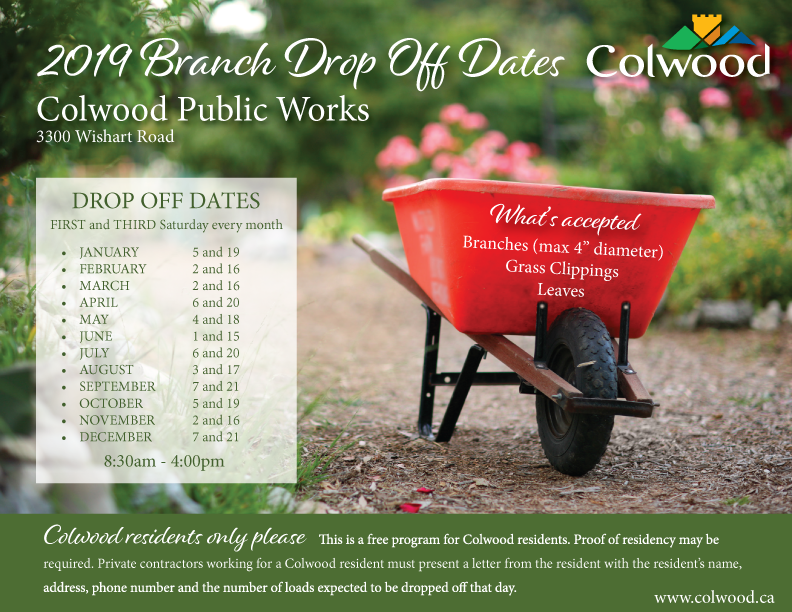 The City of Colwood provides a unique and convenient Branch Drop Off Program for Colwood residents. This program helps keep the yards in our city looking tidy and healthy. It also replaces backyard burning, which improves our air quality, protects our natural environment and creates a healthier community. The Public Works Yard is open for branch drop off from 8:30am to 4:00pm on the first and third Saturday of each month, even if it’s a statutory holiday. Our location is just below City Hall at 3300 Wishart Road. Acceptable material includes branches (maximum diameter 4”), grass clippings and leaves. When preparing your load to bring to the yard, it would be appreciated if you could separate leaves from branches and grass clippings. For further information please contact the Public Works Yard Office at 250-474-4133. Please note: This popular program is for Colwood residents only, and is free of charge. Proof of residency may be required at the gate. Private contractors who are working for a Colwood resident will be required to have a note/letter from the Colwood resident indicating the residents name, address, phone number and how many truck loads of debris are expected to be dropped off from this residence during the day. This note should be presented to the attendant at the gate.